The first round of the 2019 Stanley Cup Playoffs are winding to a close and on Sunday there will be two games where one side will be looking to close out the series. John Tavares and the Toronto Maple Leafs are up 3-2 over Patrice Bergeron and the Boston Bruins with a chance to clinch in Game 6 on Sunday at 3 p.m. ET. Meanwhile, Max Pacioretty and the Vegas Golden Knights lead Brent Burns and the San Jose Sharks 3-2 with a chance to close it out at 1 p.m. ET. Of course, if you're looking to win big in NHL DFS tournaments and cash games on FanDuel and DraftKings on Sunday, you'll have to find the best possible matchups with a small player pool. So before you make your NHL DFS picks for Sunday, be sure to check out the optimal NHL DFS lineups and advice from DFS millionaire Mike McClure. 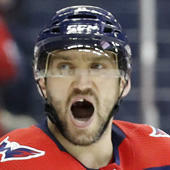 On Saturday, McClure recommended Capitals wing Alex Ovechkin at $8,700 on FanDuel. The result: He scored a goal and dished out two assists against the Hurricanes -- returning 34.4 points and nearly 4x value. Anybody who had him in their lineup was well on the way to a huge day. Now, he's set his sights on Sunday's NHL DFS slate and locked in his picks. For Sunday slate, we can tell you McClure is high on Maple Leafs center Auston Matthews at $8,400 on FanDuel and $6,600 on DraftKings. After being held scoreless in the first two games of the series, Matthews has caught fire in the last three games with four goals and an assist. Last year in a series against the Bruins, Matthews managed just two points in seven games, so the young superstar is growing more and more comfortable in a playoff setting and you'll want him in your NHL DFS lineups on Sunday. Another pick he loves: Sharks wing Timo Meier ($5,300 on FanDuel, $5,500 on DraftKings), who had 66 points in 78 games this season. Meier has registered a point in two of his last three games this series after struggling in his first two contests. He saw over 15 minutes of ice time in San Jose's win on Thursday, which is encouraging because he had only played 15 minutes or more in one of the previous three playoff games. Meier is a streak scorer and he's been playing better of late, so take advantage of the timing and his low-price tag on Sunday. McClure is also targeting an undervalued player who is set to explode for huge numbers on Sunday. He's a huge steal at his price point, so this pick could be the difference between cashing and going home with nothing. You absolutely need to see who it is before setting your lineups. So what are the optimal NHL DFS lineups for Sunday? Visit SportsLine now to see DFS millionaire Mike McClure's complete optimal tournament lineups for FanDuel and DraftKings, and cash in big on NHL DFS.